Experience the history of the Holy Land. Jerusalem will captivate you as you discover the splendour of the Church of the Holy Sepulchre, Temple Mount & the Western Wall. Live the country's biblical heritage in Galilee and admire the contrasts between hilly Golan Heights and the picturesque bay of Haifa. Explore the modern side of Israel in vibrant Tel Aviv, famed for its Bauhaus architecture. 7 Breakfasts and 6 dinners. Shared transfers in air-conditioned vehicles. For all departures except those on the July 15th and December 9th, the itinerary will start in Jerusalem (3 nights in Jerusalem, 2 nights in Galilee and 2 nights in Tel Aviv) and the hotels will be as follows: Jerusalem: Grand Court Hotel 4* or Leonardo Hotel 4*, Galilee: the Hagoshrim Kibbutz Hotel 4*, Tel Aviv: the Metropolitan 4* or Sharon 4*. 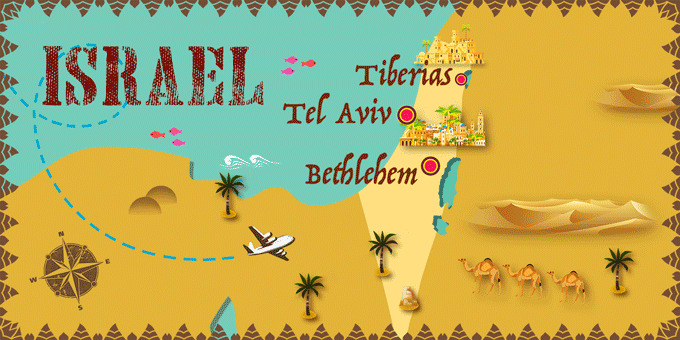 The hotel in Galilee for the December 9th departure will be the Lavi-Eden Galilee. * The international flights may not include hold luggage, only carry-on luggage, depending on the airline. You will be able to check this on your flight reservation documentation. If you want to add hold luggage at an extra cost you can do this directly with the airline. ** Possibility of booking optional excursions in the next step of the booking. Please note that all additional optional excursions which are not selected at time of booking must be requested before final payment is made at least 60 days before departure. The final price will be shown once you have selected the optional excursions, in the final step of the reservation process*** You will have the option to purchase travel insurance in the final stage of the booking. Transfers on arrival and departure will be shared transfers and passengers may need to wait up to 1 hour at the airport for other passengers. Arrive at your UK departure airport ready for a flight to Ben Gurion airport, for Tel Aviv. Upon arrival transfer to Tel Aviv and to your hotel. Overnight stay in Tel Aviv. Breakfast at the hotel. Visit the old town of Jaffa for a short tour. Next, visit Caesarea to see the ancient port and Roman Theatre and Hippodrome. Continue to Haifa to enjoy a panoramic sightseeing tour including the stunning Baha'i Shrine and Gardens, Mount Carmel and Haifa Bay. Depart west towards Acre and enjoy a visit of an impressive Crusader stronghold, dating back to Medieval times. Dinner and overnight stay in Galilee. Breakfast at the hotel. This morning, drive to Golan Heights, a hilly area overlooking the upper Jordan River valley, occupied by the state of Israel. Here, visit a former Syrian fortification, used during the Six Days War between Israel and the neighbouring states of Egypt, Syria & Jordan in 1967. The hills of the area are home to many vineyards; enjoy a tour and tasting at a local vineyard. Continue your tour of the region at the Mount of Beatitudes and visit the ruins of an ancient synagogue as well as the disciple Peter's house in Capernaum. Visit other biblical sites such as Tabgha, where the Miracle of the Fish & Bread took place and enjoy a short tour of Tiberias. We recommend an optional boat excursion on the Sea of Galilee. * Dinner and overnight stay in Galilee. *Optional Sea of Galilee Boat Excursion can be booked at the destination only. Breakfast at the hotel. Head to Safed, city of the Kabala, where you can discover the mystic alleyways, visit a local synagogue and discover an artist's colony. Afterwards, proceed to Nazareth, to explore the Church of the Annunciation as well as the legendary carpentry workshop of Joseph. After passing through the Jordan Valley, arrive at Beit Shean, a historical city close to the border with Jordan. Here you can enjoy a fascinating visit to the beautifully preserved excavations of the old Roman City. Then, head north, passing by the world's oldest city, Jericho to finally arrive to Jerusalem. Dinner and overnight stay in Jerusalem. Breakfast at the hotel. This morning, explore East Jerusalem and start the day with a panoramic view of the city from the top of the Mount of Olives. Continue to the Garden of Gethsemane and the Church of the Agony. Head back into the city and visit many of the most emblematic sights of the city including Israel Museum, home to the famous Dead Sea scrolls and the beautifully renovated Model of the Herodian city of Jerusalem, dating back to the time of the Second Temple, a pivotal time period for members of the Jewish faith. Visit Yad Vashem a poignant memorial to the six million Jews who were killed in the Holocaust. In the afternoon visit the picturesque village of Ein Karem, the traditional birthplace of John the Baptist, a leading religious figure. Dinner and overnight stay in Jerusalem. Breakfast at the hotel. Today, discover Jerusalem's immortal Old City with a tour of the most revered sights in both East and West Jerusalem. Visit the Western Wall, and the area around Temple Mount, two prominent sites in both Judaism and Islam. Appreciate the colourful bazaars along the city streets. Walk along the Via Dolorosa and the Stations of the Cross, ending in the sacred Church of the Holy Sepulchre, thought to be the site of Christ's death, burial and resurrection. Afterwards, head to Mount Zion, to visit the Tomb of David, the Room of the Last Supper and the Dormition Abbey. In the afternoon, continue to iconic Bethlehem* where you will have the opportunity to explore the Church of the Nativity and enjoy views of the Shepherd's Fields. Return to Jerusalem for dinner and an overnight stay. *Site is in the West Bank, under the Palestinian Authority Jurisdiction. The visit is subject to the situation at the time. Breakfast at the hotel. Spend the day at your leisure. we recommend an optional excursion to the Dead Sea. * Dinner and overnight stay in Jerusalem. * Optional Dead Sea Excursion: Take an excursion to the iconic Dead Sea for a day of relaxing and bathing in the salty waters, world-renowned for their high mineral content. Price per person: £112. Breakfast at the hotel. At the indicated time, transfer to Ben Gurion airport for a return flight back to the UK. Arrive in the UK and end your trip. No advance visa is required. Visas are issued for free on arrival in the country. Many businesses open from Sunday to Friday and close on Saturday.